Royal Heriz rugs, a beautiful & intricate high quality traditional rug in popular toned-down washed shades. 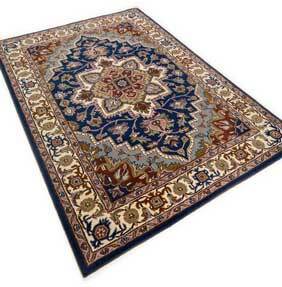 Heriz rugs are hand-tufted in India. The design is inspired by ancient, hand-woven, Persian rugs, woven in the region of Tabriz where similar patterns were made hundreds of years ago. This range is made from 100% pure wool, the pile weight is 3.5 KG/m2 and the pile length is around 12cm. Royal Heriz rugs can be custom made to your required size.